Remember being stuck inside last winter with three feet of snow outside? 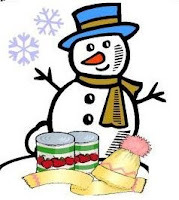 This winter, when it snows, bring your non-perishable, canned food items and clothing donations to Hibernia County Park to build and decorate as many snowmen as you can. All items collected will be donated to the Chester County Food Bank and Goodwill. Snowmen to be judged must be built next to the Mansion, near the Lake Trail head. Prizes will be awarded for the best decorated snowman in child, youth and adult categories. Don’t want to build a snowman? Park staff will gladly accept your donations at the Park Office.